Way back in early 2007 after over 10 years working in Central London I decided I wanted to work closer to home, with more flexibility around family life. I sent my CV to Suzanne on the off chance that they might need an administrator and the rest is history! What do you do at SJHQ? I first started out as a general administrator, doing a bit of everything. About 3 years ago I took over as the main contact for all enquiries relating to the Horniman Museum & Gardens. I also help out a lot with marketing – the monthly newsletter, Facebook, Twitter….Sue tends to throw ideas at me rather like a jigsaw puzzle and then I put them together for her!! What did you do before you worked for Suzanne James Catering? How far back do you want me to go?! Many moons ago I worked in PR & Sponsortship for a local Radio Station in Coventry, then I came to London and worked in the Media Department of one of the big 5 advertising agencies, before leaving to become a high level PA in the City where I looked after one of the Senior Partners at a top Management Consultancy for 10 years. I was always the one that organised company away days or drinks and I really loved that part of my job, so it was a very natural progression into full time event planning! It is much more exciting to be a big cog in a small wheel, than a small cog in a very big wheel! I love working locally, and feeling ‘plugged in’ to the local community – I have met so many great people through my job, and I really love the whole Suzanne James ethos, not least because grew up on a small holding, so eating fresh, seasonal produce goes right back to my childhood. 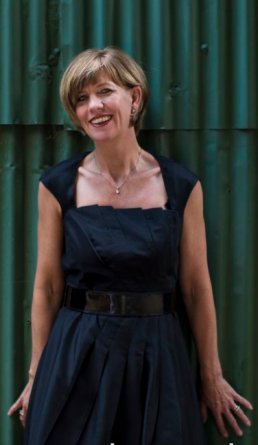 I feel like I make a really big difference as part of the Suzanne James team – both because of the skills and experience I bring into the business, but also in terms of helping people to have their dream weddings and parties. I still get excited about every single event, and I think my favourite thing is when a Bride & Groom pop in to say hello and thank you after their wedding. I love knowing that we made their dreams come true, there is no better feeling. Last but not least, I have learnt such a lot about cooking over the past few years! My knowledge of Excel, Powerpoint & Word has been as good for them, as their top cheffy tips have been for me! I always loved to cook, but I have definitely expanded my horizons (& possibly my waistline) since working here! What's your favourite food to eat? Well the guys all say I am the easiest person in the world to feed because I love everything and that is pretty much spot on! It is hard for me to pick a favourite dish, but if I must it will have to be Christmas Dinner – I love the food and the whole family vibe, and actually any proper Sunday Roast would have to be a close runner up for the same reason. I mentioned before that I grew up on a small holding in the midlands and my Mum would always make the most amazing roast dinners, home made soup to start, then a roast with yorkshire puddings (no matter what meat it was), amazing gravy, and something like homemade Treacle Sponge Pudding or Blackberry Pie for dessert. For me food and family go hand in hand. If you could dine with anyone, past or present who would it be? I am going to cheat and make up a table of 6, seated boy girl around a 5ft round table! Elvis Presley (in his 20s), Robin Windsor (professional dancer from Stricly Come Dancing), Patrick Stewart (phasers on stun! ), Audrey Hepburn (I couldn’t have done it without you darling! ), Bridget who works here & can talk to anyone about anything….and me! We would have such a fantastic evening, oh if only!! Mostly being a Mum, running the house, reminding my two girls to do their homework & flute practice & popping up to the allotment whenever I can fit it in. I try really hard to keep fit (I spend all day around food so I really have to exercise – I’m loving Spin classes at the moment). I also go ballroom dancing once a week and am a huge fan of Strictly Come Dancing. There is so much more I would like to do but I just don’t have time! In your opinion what makes Suzanne James Catering different from other catering companies? Well first and foremost our food is consistently outstanding. Over my time working in the City I was exposed to some pretty awful catering, and these days I am probably even more picky! That, combined with the fact that we really do care about every single event are the defining points for me. If I was planning a party I would want to have a team like this helping me. So why are you wearing an eyepatch, is it permanent? I really hope not! In October 2014 I realised I was getting very distorted visition in one eye. My opticians told me to go straight to Moorfields Eye Hospital, and they diagnosed a Macular Hole – a hole in the back of my right eye. In February 2015 I had day surgery to hopefully fix the problem, and without going into too much detail, part of the process is to have a gas bubble in my eye and to lie face down for a week after surgery!!! It sounds awful, but actually for someone who spends most of their life dashing from A to B to C it was pretty amazing to be instructed to lie down for an entire week and rest (I was allowed to watch TV on my Ipad & to read so it really wasn’t too bad). I had amazing help from family and despite feeling very nervous about it all, in the end it wasn’t half as bad as expected. The highlight of my recovery had to be the bouquet I got delivered with a card that said “God, best I send you flowers or I will never hear the end of it, love Sue”. It really made me laugh and beautifully sums up our fab relationship! 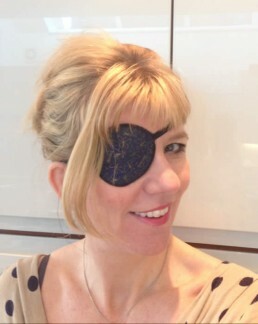 I am now well on the road to recovery, but the gas bubble takes about a month to disperse and until it’s gone my vision through that eye is a bit strange so hence the eye patch. I am told it’s kind of cool and don’t really think about it too much now, except when they are teasing me about it in the office – which is quite a lot!!!! !